Armilia is a mysterious underground city located at the North Obscure Pole. The only part of it ever seen looks like a cross between an armiliar sphere and a complicated clock. It appears that it can be used to manipulate both Time and Weather. The serious breakdown of 746 AT may have been caused by a little boy named Bronislaw Kunkely, believed to possess paranormal powers. 1). Whether young Friedrich/Robur truly helped to repair the mechanism is open to interpretation. 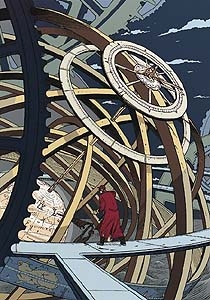 Professor Théophraste Pym presides over the smooth operations of the city, François Schuiten and Benoît Peeters are the Assesseurs (assistant directors) of Armilia. An armillary sphere (variations are known as spherical astrolabe, armilla, or armil) is a model of objects in the sky (in the celestial sphere), consisting of a spherical framework of rings, centred on Earth, that represent lines of celestial longitude and latitude and other astronomically important features such as the ecliptic 2).